On the first day of the Spiel show in Essen, Steamforged Games celebrated by revealing two of the player cards from Kick Off! Behold, the dazzling Scarlet Star, Harmony, and the rough and tough captain of the Brewers, Tapper. Both players will be very familiar to veteran coaches, but both have experienced some very interesting changes as we move into Season 3. Enough with the pre-game, let’s take a closer look! The biggest difference for Harmony is her new, restructured playbook. 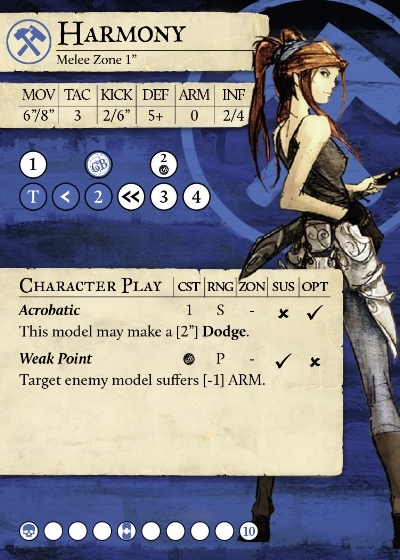 While the core results remain the same (such as her momentous tackle, dodge, and damage results), a momentous Character Play result now appears earlier in her playbook along with more damage results for coaches who want to push for that key take out. This is more achievable than ever before with the addition of Weak Point, which replaces one of her previous characters plays: Scything Blow, giving Harmony a crucial support tool that can benefit the rest of her team and better align her with the Mason’s overall playstyle. 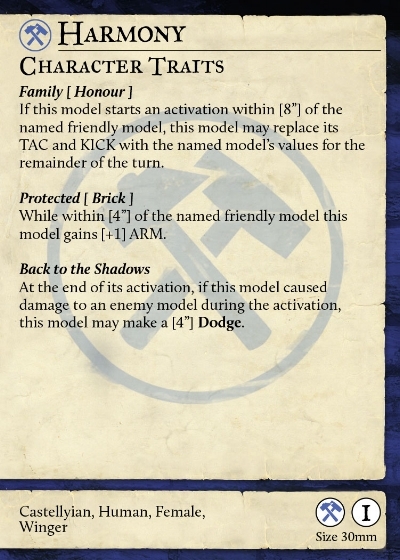 With the addition of Back to the Shadows (a 4” dodge at the end of an activation in which she dealt damage), Harmony can now rush in, inflict Weak Point on an enemy model to reduce its armour, and inflict a bit more damage with additional attacks—all before dodging safely away! Harmony has always had a flair for the spotlight, which was reflected in her difficult to pin down nature from her previous versions. She knew dancing around dangerous opponents was a sure-fire way to entertain the crowd. So if your rivals thought she was tough to pin down before, they’re going to have a much harder time now, thanks to the updates toAcrobatic. Instead of giving her extra defence against Parting Blow attacks, it now grants her an immediate 2” dodge! Not only is it still an extremely useful tool for avoiding Parting Blows but it also adds an amazing tool for coaches to extend her movement and threat range when needed. The final big change to Harmony was to adjust the bonus from the Family (Honour)rule. We’ve doubled the range of the effect to 8” to better pair with Harmony’s extra mobility. That’s right, greater threat range, added defensive abilities, and she can operate farther away from her captain! All together, these changes make Harmony a great player for any team roster wanting a versatile toolbox on their team with an edge of danger about them! Going forward into Season 3, Steam Forged wanted to highlight Tapper’s role as the Brewer’s team captain by zeroing in on his teamwork potential. Since teamwork is a bit more captainly than always getting the job done yourself. Much like Harmony, Tapper’s stat line remains very similar except for one very important change: pushing his INF attribute up to 4/5. Note, however, Tactical Advice (Scum) has had a tweak as well. It gives a [+0/+1] INF bonus instead of the [+1/+1] bonus it gave previously, making Tapper less reliant on the exact position his feline mascot. This is still an overall increase to the Influence coaches can allocate him during the Maintenance Phase. We know, it doesn’t seem like we’ve shifted this captain towards being a team player quite yet, but take a look at his Heroic Play,Old Jake’s. Now the shift should come vividly into focus. Old Jake’s is now limited to other friendly Guild models, but its range has been increased to 6”. Tapper can still trade in  Momentum for his team to gain  Influence, but that Influence will now need to be shared among other Brewer players. 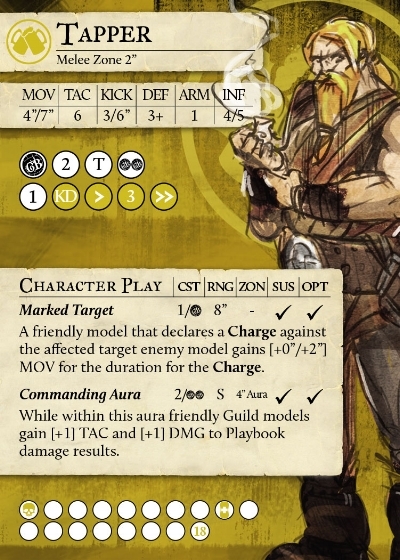 We’ve also moved the Character Play result for Commanding Aura down by one hit, making it easier to trigger with an Attack rather than by spending  Influence. There’s a lot there to consider on Tapper. 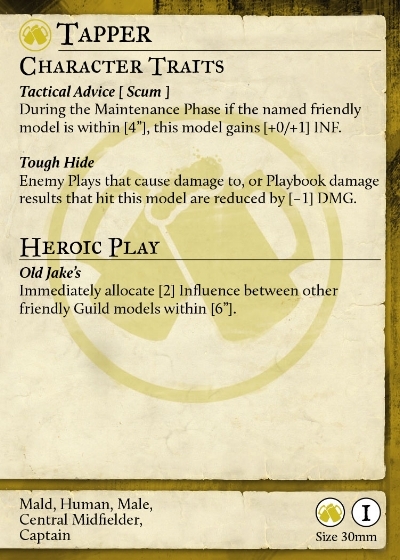 He’s given up the ability to target himself with Old Jake’s, but he now has better Influence generation without Scum around, higher max-Influence, and easier access to Commanding Aura. These changes will require Brewer’s Guild coaches to rethink this fan favourite captain a bit, but we’re confident they will ultimately love the new Tapper and the opportunities he brings to the field.